M.L.I.S. from an ALA accredited college or university; three years’ experience providing reference service to students, faculty, attorneys and other legal professionals and two years’ teaching experience, although strongly related experience or equivalent combination of education and experience will be considered; familiarity with and interest in online teaching; thorough understanding of and experience with research methodology using print and electronic resources; familiarity with library operations and emerging technologies; knowledge of inter-disciplinary research practices; excellent oral and written communication skills; excellent organizational, time-management, and analytical skills; strong customer service orientation; ability to work independently and as part of a team; creativity, passion and enthusiasm for librarianship, courage to propose new ideas, projects, and workflows; and flexibility. Ability to work ~10 hours per week at the Minnesota State Law Library during regular business hours, Monday – Friday, 8:00 am – 5:00 pm (excluding holidays). Preference may be given to applicants with a legal background or those who express interest in law librarianship. Description: The Minnesota State Law Library Internship provides supervised experience in three key areas of law library operations. Perform basic legal research to assist library patrons and staff, including the Law Library Services to Prisoners program. Your cover letter should address your reasons for applying for the Minnesota State Law Library internship, including how the experience will assist you in reaching your academic and career goals. Please also include a preferred weekly schedule. For candidates currently enrolled in a graduate library or information science program, your references should include at least one current professor who is able to comment on your academic work. Applications will be accepted until the position is filled. *Dates of the internship may be modified to best meet the needs of the library and the intern. General questions may be addressed to: elvira.embser-herbert@courts.state.mn.us. Have you discovered a new product that you think is great? Nominate it for the New Product Award! Any AALL member may nominate products. Vendors can nominate their own products. This award honors new commercial information products that enhance or improve existing law library services or procedures or innovative products which improve access to legal information, the legal research process, or procedures for technical processing of library materials. A "new" product is one which has been in the library-related marketplace for two years or less. New products may include, but are not limited to, computer hardware and/or software, educational or bibliographic material, or other products or devices that aid or improve library workflow, research, or intellectual access. Products that have been reintroduced in a new format or with substantial changes are eligible. 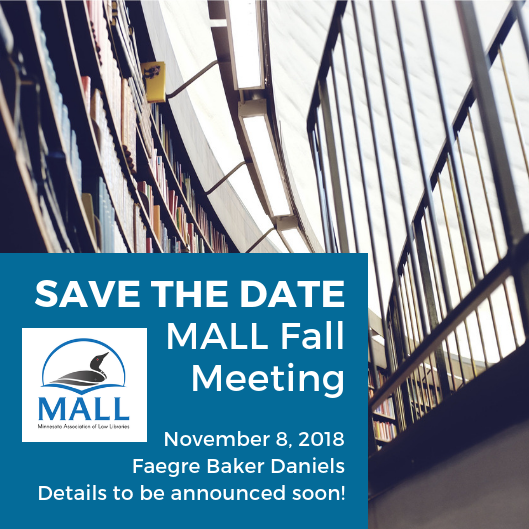 MALL's bylaws require that we provide a vehicle for the delivery of election results, budget updates, changes in dues, and other information. In the past, MALL has provided this information, along with articles and updates in a regularly published pdf/print newsletter. Over the years, we (the newsletter staff) have gotten anecdotal feedback from membership about how you want to see this content delivered – some of you like things just as they are, but there are some of you who are looking for an update. Now’s your chance to let us know what you think. Below is a link to a mini-survey. It’s so tiny it is actually kind of cute. There are three questions total – two are *multiple choice* and one is a *totally optional* contact info question. Sounds pretty painless, right? We would be eternally grateful if you’d take a minute (literally, one minute) and answer the questions for us. Thank you in advance for sharing your thoughts! We look forward to incorporating your feedback into MALL’s communications. You can now see the PowerPoint presentations from the MALL Spring Meeting at http://mall.wildapricot.org/page-1829087. The CLE codes for the events are below.